contact PhotoZone Book a Tour! An easy 2 ½ hour drive west of Las Vegas, you'll discover a unique environment as extreme as anywhere on earth. 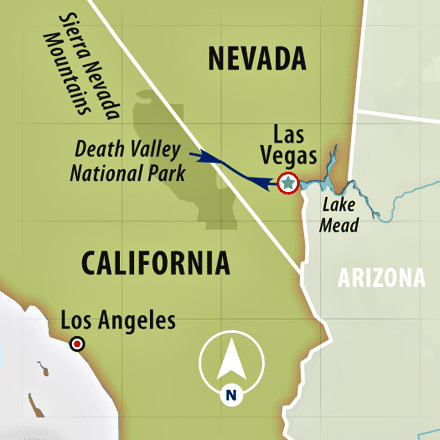 To the uninitiated, a trip to Death Valley might beg the question, "Why?" But to those who appreciate the stark beauty of nature's extremes, the valley is an irresistible magnet. Among serious landscape photographers the question is not, "have you been?" it's, "how many times?" Every mile on the valley floor offers changing topography that becomes a unique canvas for light, sculpting sensuous shadows and revealing blistering detail. From Telescope Peak at 11,049 feet, the drop to the lowest point at Badwater ( 282 feet below sea level ) is twice the depth of the Grand Canyon. Get the picture? This is a place where scale takes on a whole new meaning. Think Sahara. Over the millennia wind erosion of the surrounding mountains has deposited sand dune fields whose ambiance will delight your senses (desert scenes for many movies have been filmed here, including Star Wars). Think volcanic. Ubehebe Crater is half a mile wide and up to 700 feet deep. The surrounding landscape is peppered with the ejecta of the eruption thousands of years ago. Think moving rocks. Moving rocks?! Yes. On the Racetrack Playa rocks move and leave tracks in the earth to prove it, much to the dismay of the scientific world. These rocks really rock! 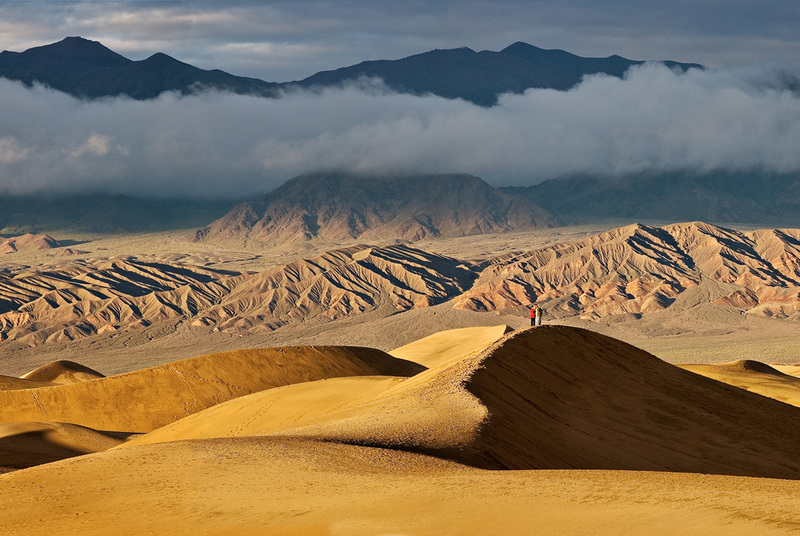 Death Valley with PhotoZoneTours is not your typical tour. Our itinerary is longer and flexible. Great images can mean returning to the same place more than once when weather frustrates your creative vision. And rigid itineraries such as, "Tuesday am is the only sunrise in the dunes, sorry it's totally overcast " don't cut it in the PhotoZone. We know why you came and our itinerary flexes daily to make the most of the light and the weather. Long days are tiring, we get that. That's why there will be scattered mid-day breaks when the light is flat. Download, nap, or just chill. And if you think the PhotoZone closes when the sun goes down, think again. Death Valley offers some of the most accessible light-pollution-free night skies in the world. We'll be scoping out the heavens for the Milky Way and doing star trails, Death Valley style. Despite it's well deserved summer reputation as a dangerously hot destination, visiting in December will be delightful with warm, but not blistering days and cool nights. For those flying in, we will meet in Las Vegas on Tuesday, December 2nd. Once everyone is on site we'll leave directly to overnight in Death Valley and be ready for our first sunrise the following morning. While we will visit all the most photogenic attractions, such as Mesquite Flats, the Racetrack, Mosaic Canyon, Ubehebe Crater, Dante's View, Badwater Basin, and Artist's Palette, we will choose specific locations on a day by day basis. You know what you'll be getting in the PhotoZone. Hotel accommodations? Single occupancy rooms included. Transportation? You get to Las Vegas and we do the rest. World class photo advice? Professional photographers Layne Kennedy and Mark Alberhasky are shooting elbow to elbow with you in the field, sharing technical and artistic insights that will take your images far beyond travel snapshots. And the PhotoZoneTours difference? A small group footprint and amazing participant to instructor ratio: Layne and Mark with only 6-10 PhotoZoners. Join Mark and Layne this December for Death Valley at it's best! Daily departures for sunrise shoots, mid-day locations where light angles are less critical, scheduled down times, sunset and night sky shoots.